No matter what you're looking for, retailer JCPenney has it. From home goods and jewelry to lingerie, toys and furniture, JCPenney sells a wide variety of goods online, which means that you can shop anytime, day or night. You can outfit your entire home, from kitchen to bedroom and even your outdoor space, with merchandise from JCPenney. You'll find rugs, curtains, bedding, floor lamps, table lamps, desks, chairs, kitchen tables, coffee tables, and other pieces of home furniture. Stock up on a new mattress, which can even be delivered right to your door. JCPenney's wide selection of bedding inventory also includes special-themed sheet sets, comforters, pillows, and other items for infants, children and teens. The bed and bath department sells sheets, curtains, bath mats, washcloths, towels, mattress toppers, shower curtains, shower accessories, and bed kits. Brands you'll find at JCPenney include Martha Stewart's tasteful, classy designs, Sealy, JCPenney Home, Studio Sherpa, Chris Madden, Home Expressions, Linden Street, Croscill Classics, and many more. Clothing for every size, shape, and taste is thoughtfully curated at JCPenney. Women's clothes come in petite, plus size, tall, and maternity. Juniors, girls, and boys clothing also come in plus size. Parents of infants and toddlers will find plenty of adorable onesies, burp cloths, baby shoes, baby accessories, and other baby gear. JCPenney stocks 0-24 months and 2t to 5t for children's clothing in stores and online. Clothing brands to look for at this popular department store include IZOD, The Original Arizona Jean Company, Liz Claiborne, Claiborne Men's, Puma, l'amour nanette lepore, Worthington, St. John's Bay, nicole by Nicole Miller, American Living, and Dockers. In addition to its vast inventory of clothing, JCPenney sells watches and jewelry including gemstones, engagement rings, wedding rings, and casual jewelry. You'll also find handbags, wristlets, wallets, belts, fashion jewelry, fashion hats and other headwear, scarves, wraps, flip flips, hosiery, tights, fashion socks, sunglasses, jewelry boxes, and armoires for jewelry storage. In addition to its large stock of home goods, JCPenney carries outdoor living furniture. Find patio tables, umbrellas, cushions, pillows, covers, outdoor chairs, outdoor rugs, fire pits, grilling accessories, and outdoor dining needs. 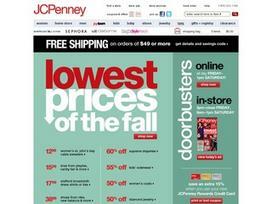 JCPenney holds a variety of item sales and promotions through "Fair and Square Pricing" and month-long promotions. Website displays combine exceptionally curated merchandise with artful presentation. JCPenney also allows you to create a gift or wedding registry or purchase registry items for friends and family. JCPenney also sells a variety of clothing, home goods, jewelry, beauty products, and other goods from other retailers and from its own brands. The JCPenney brand began in 1902 in Wyoming, as a department store called The Golden Rule, changing its name to the more familiar JCPenney in 1913. While JCPenney still maintains a large fleet of retail and outlet stores across the United States, you'll enjoy the convenience of shopping fort goods over the Internet. The company prides itself on exceptional customer service, artful displays, sales that let you take advantage of deep price cuts, and a wide variety of merchandise. Share what you think about JCPenney, and your favorite ways to save there! I’m glad JCPenny has online coupons now. Please keep posting these deals. They are actually saving me money! I find better deals online than in the stores. JC Penneys is the only place I can get our tall jeans for our family.